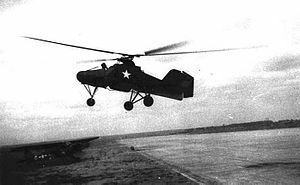 ^ Questions, questions, answers: Were helicopters used in WWII? ^ Smith and Kay 1978, p. 595. Lang, Gerhard. Flettner Fl 282 (The Luftwaffe Profile Series , No 6). Atglen, PA: Schiffer Publishing, 1996. ISBN 0-88740-921-0. Smith, J. Richard and Kay, Anthony. German Aircraft of the Second World War. London: Putnam & Company Ltd., 1972 (3rd impression 1978). ISBN 0-370-00024-2.